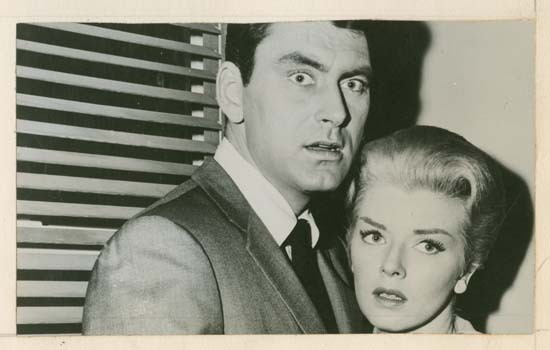 Joe Simon had a large art collection. 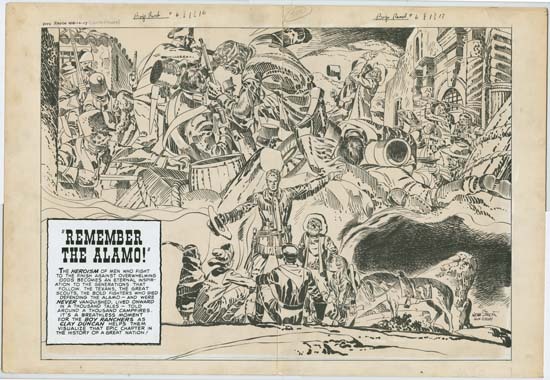 It might be expected that most of it would consists of work that Joe did himself or were drawn by Jack Kirby as part of their long collaboration. 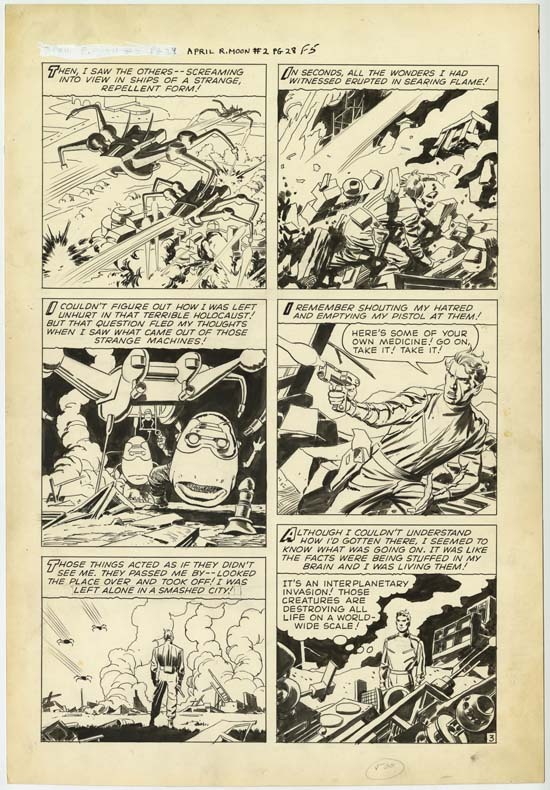 While Joe owned a fair amount of art drawn by Kirby it still amounts to a small fraction of the total collection. Over his career Simon worked with a lot of artists and work by many of them were in his collection. 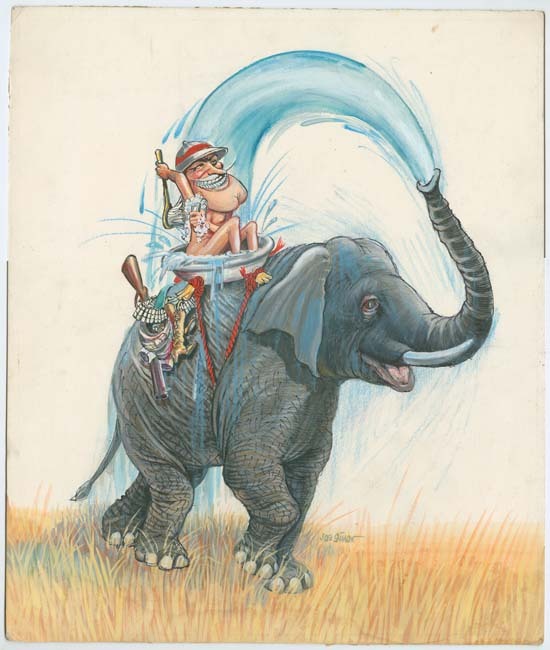 One that Joe particularly liked was Jack Davis. 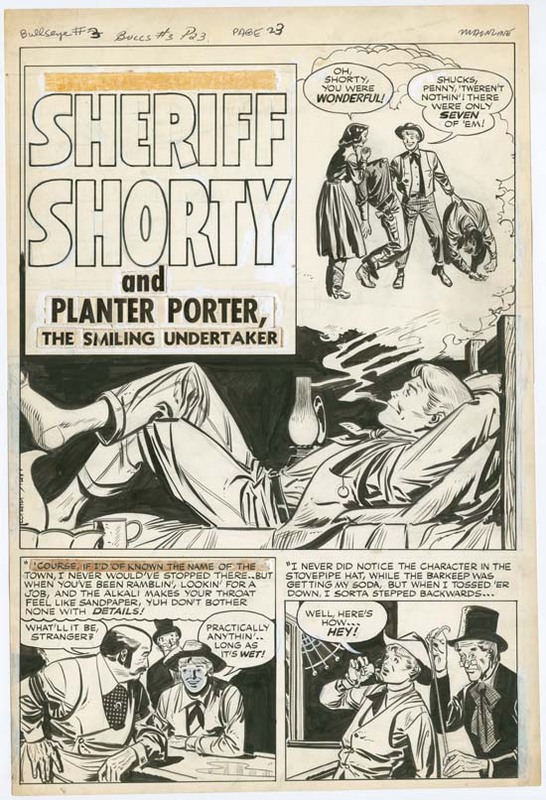 Joe would say that Jack Davis was as great an artist in his specialty as Jack Kirby was in his. 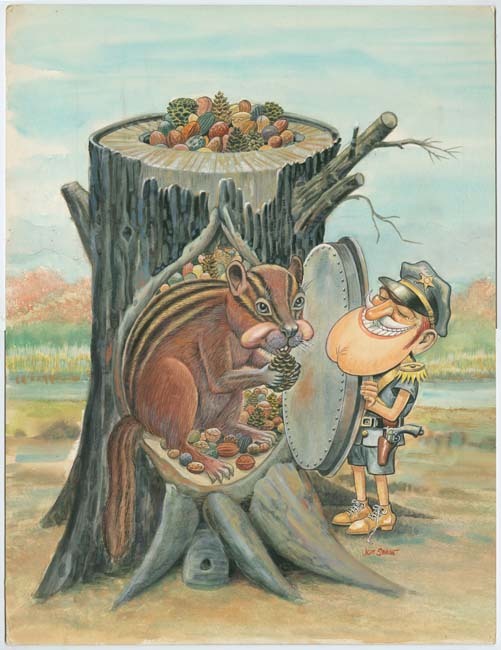 Davis was probably most famous for his covers for Mad magazine but he did cover art for other satirical magazines as well with Joe Simon’s Sick being one of them. Joe’s collection has a number of the Sick covers that Davis creates, all of them quite wonderful. 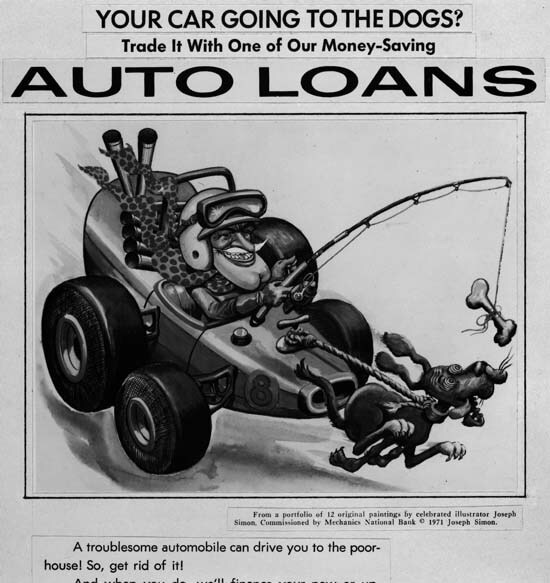 Sick was a knock-off of Mad and featured the same irreverent humor. 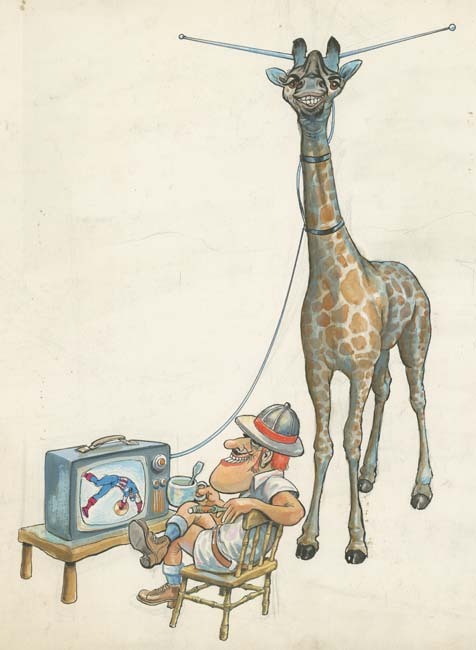 Public icons were frequently subjected to a humor that many adults of the day would find objectionable. Of course that was the whole point. 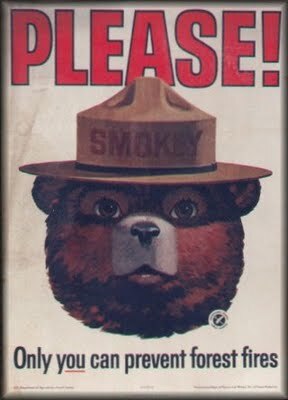 When I was young Smokey the Bear advertisements were quite common but he has since been retired. 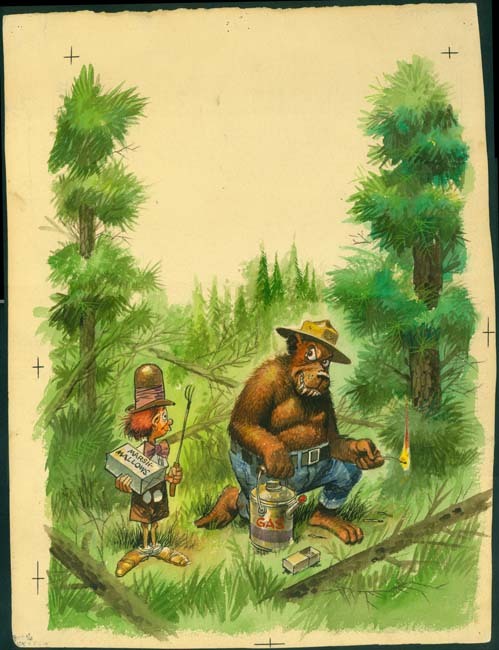 Although a bear, he had a friendly face not like the toothy bear with an evil grin found on the cover of Sick #23. There he was accompanied by Huckleberry Fink. 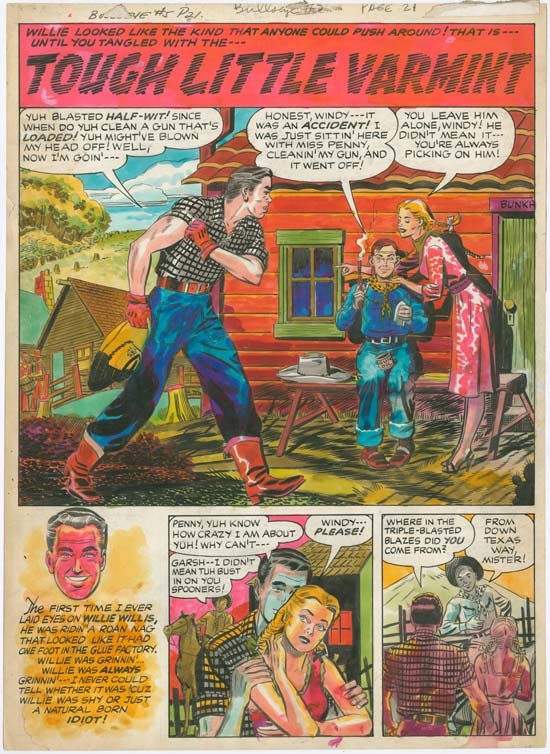 Huckleberry Fink was the mascot for Sick while Alfred E. Neuman had the same role for Mad. 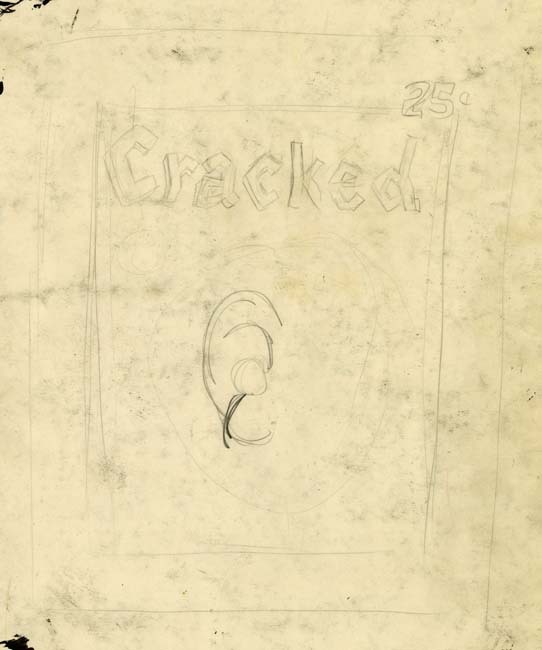 The back of original comic book art sometimes has interesting art but that found on the back of the art for Sick #23 seems something special. 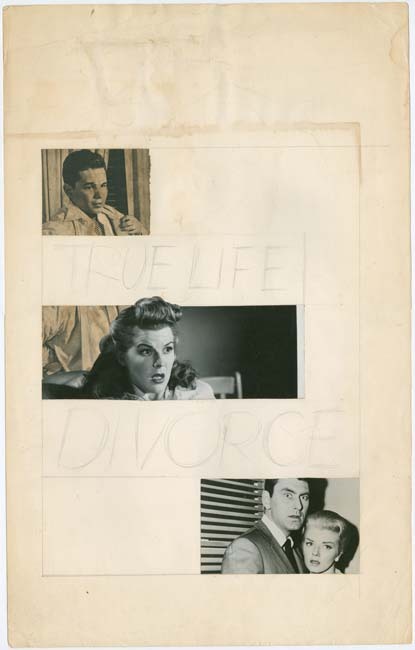 It appears to be an uncompleted cover art for a humor magazine. 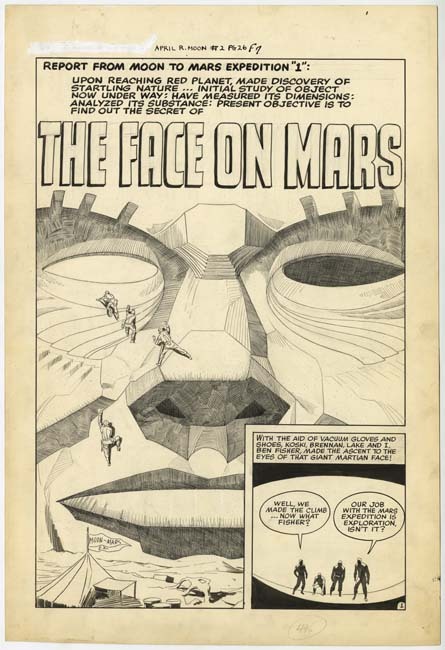 The size pretty much matches the image that was actually used for the Sick #23 cover and there is ample room at the top for the magazine title. 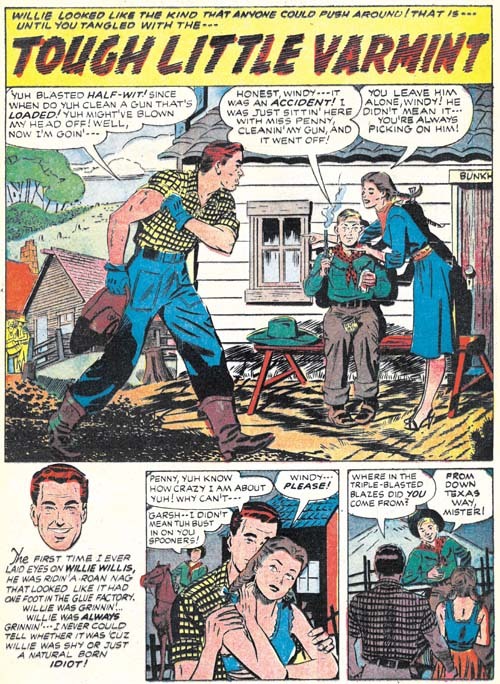 The barroom scene includes three wonderfully characterized figures. It is really quite nice but to be honest I do not understand what is supposed to be the point. Perhaps that is why the art was abandoned. 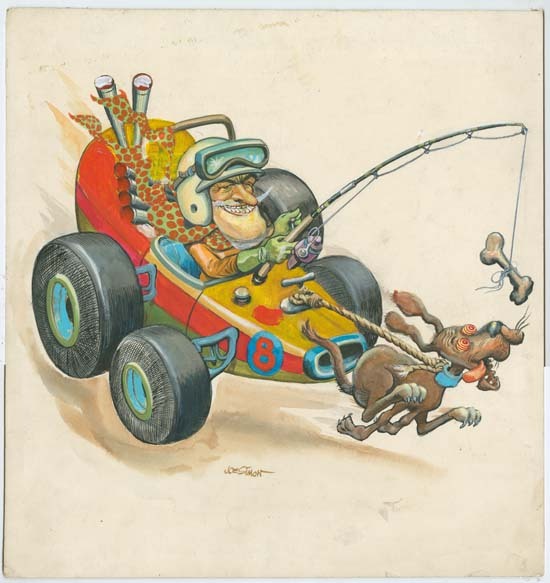 Typically the humor of a cover by Jack Davis is quickly comprehended without the need for thought balloons or any text. That quality is lacking for this unfinished art and is probably the reason the work was suddenly terminated. 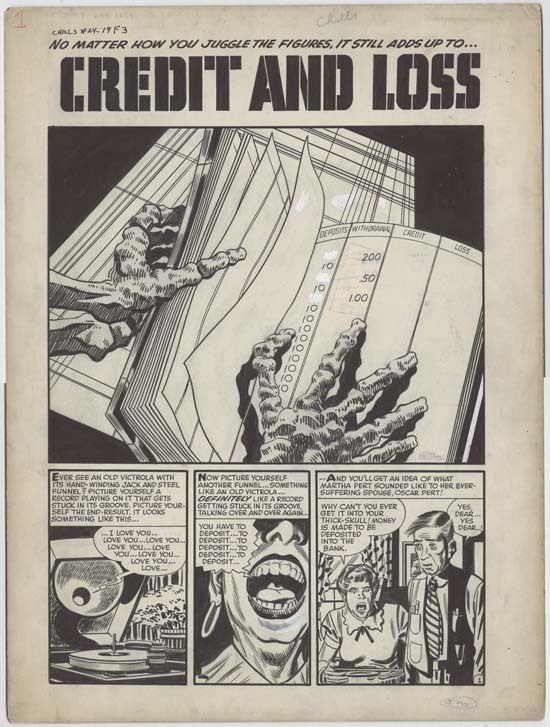 But there was no reason to waste the cost of the paper so the opposite side was used to create the more successful cover art. 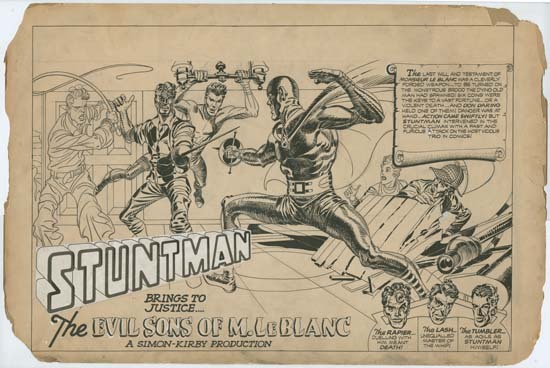 In this post about original art I will discuss a cover by Marvin Stein. 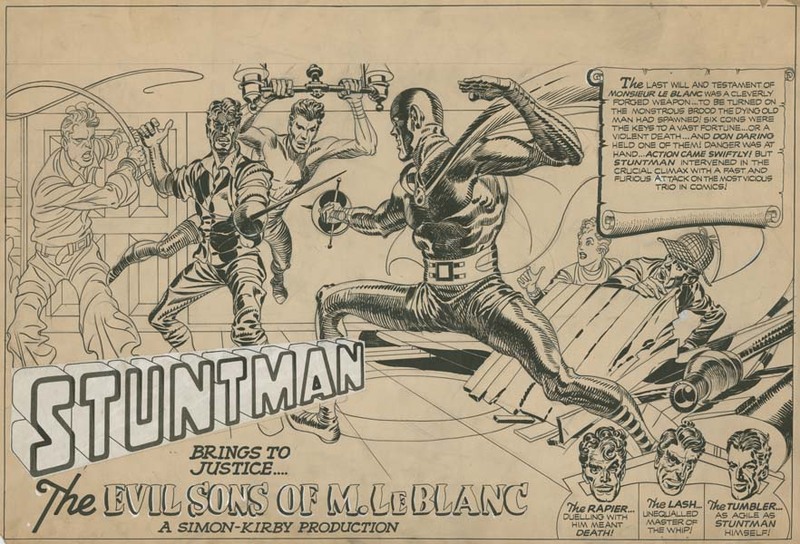 Stein was one of the few artists who actually worked in the Simon and Kirby studio. 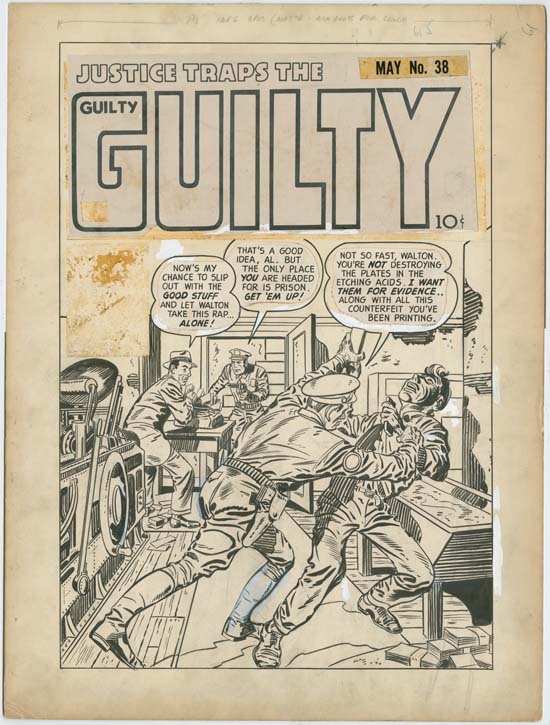 Stein is not well known in current comic book fandom but for a long period of time he was the lead artist in Price Comics crime titles, Headline and Justice Traps the Guilty. 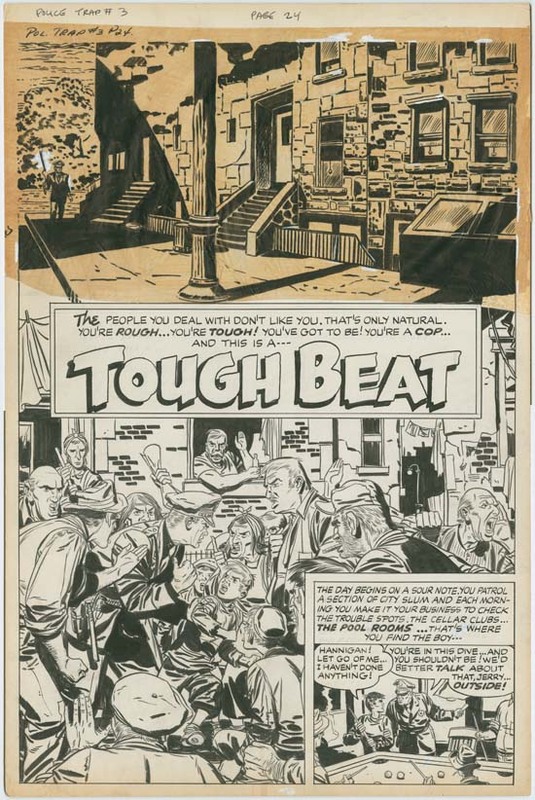 Except for a few covers done by Jack Kirby and some others based on photographs, Marvin did all the covers for Headline issues #46 to #77 (March 1951 to September 1956) and for Justice Traps the Guilty #24 to #88 (March 1951 to August 1957). 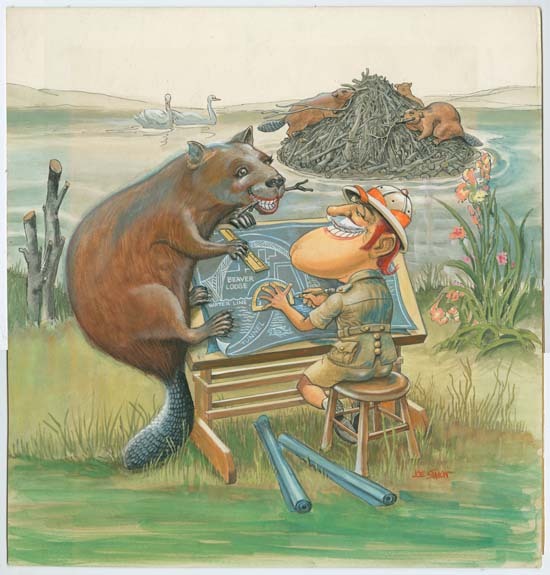 For more information on this topic see Criminal Artists, Marvin Stein. 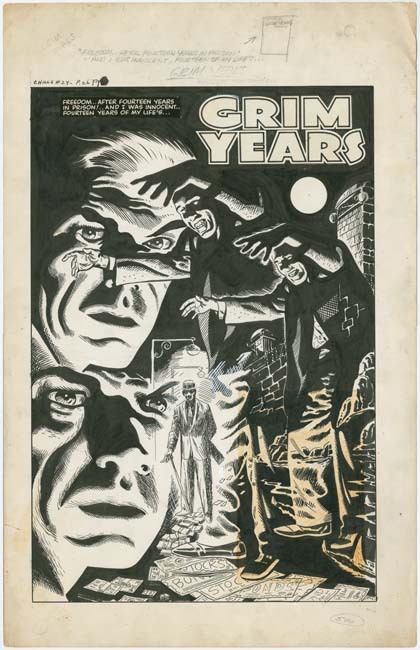 The cover that I post about this time is from relatively early in his work on crime comic books. 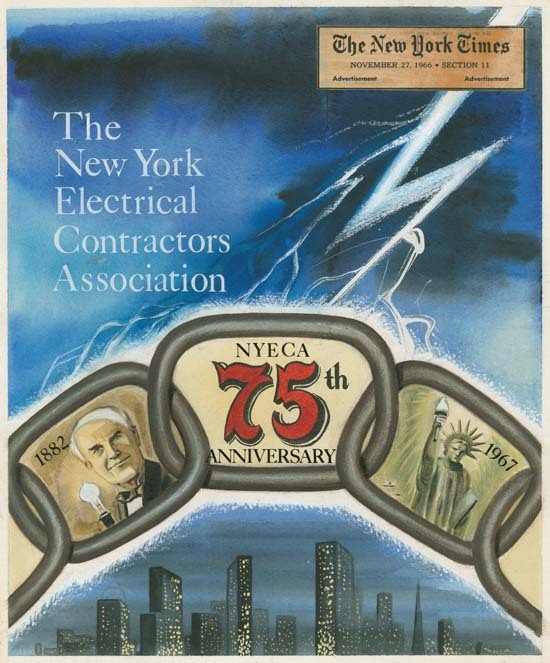 While the paste-ups are original, they are not the originals for this particular cover, rather they are from issue #38. 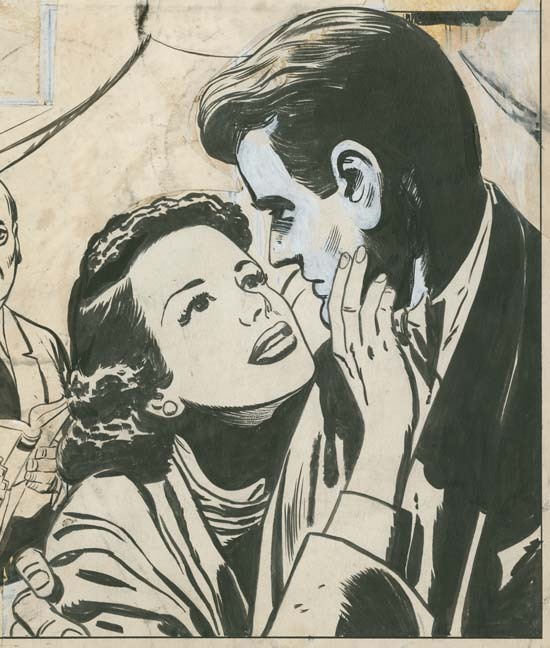 Rubber cement was often used for attaching paste-ups because it was inexpensive, quick and convenient. Unfortunately there were negative consequences in the long term to this use of rubber cement. Sometimes the chemicals in the rubber cement would stain what they were attaching. Often with time the rubber cement would become brittle and loose its adhesive qualities causing attachments to fall off. It would take years before either of these detrimental qualities took effect. 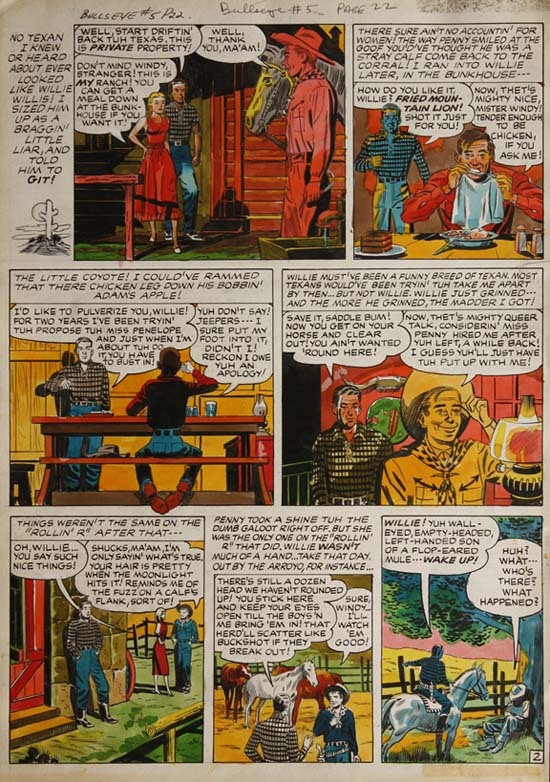 At the time the long term survival of original comic book art had no importance as it was considered worthless once it had fulfilled its role in the production of the published comic book. 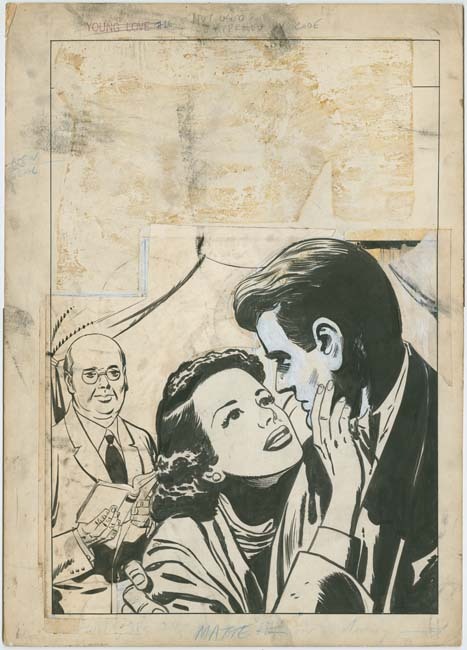 In this case the original paste-ups fell off and were re-attached to the wrong comic book art. There is a reason I picked this particular cover art to discuss which I will return to below. Before that I wanted to explore the use of white-out. 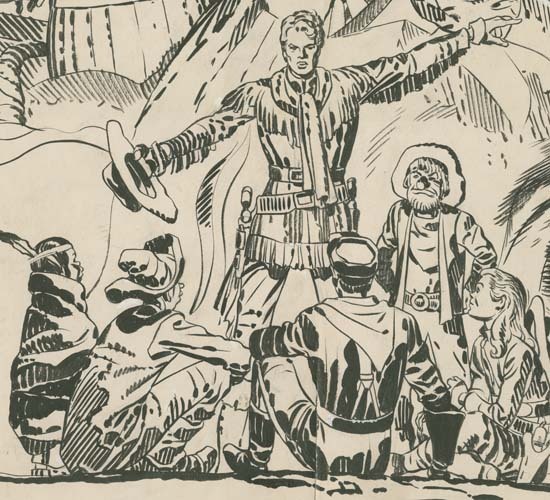 White-out was applied by comic book artists to correct defects created during the inking of a piece. 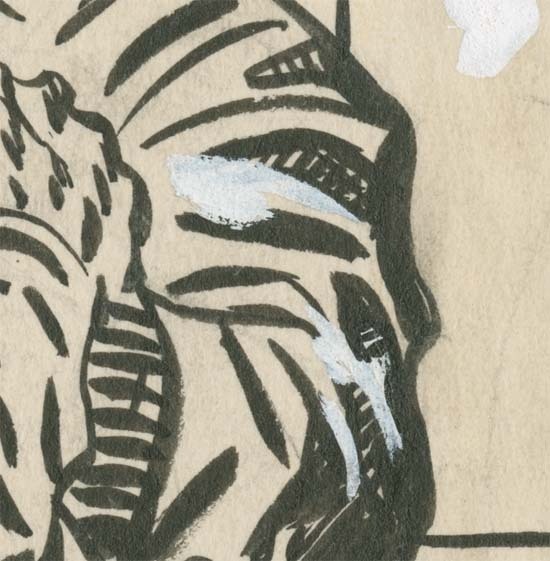 Inking errors could not be simply erased but could be covered up with white-out. As for instance an erratic brush stroke. 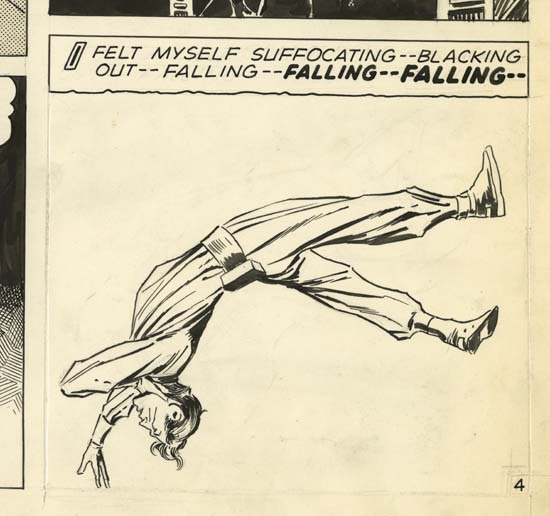 That seems to be the case for the white-out applied in the speech balloons and the frame lines on the right. A similar explanation could be used to explain the white-up on the printing wheel. Some of the corrected inking can still be seen under the white-out. 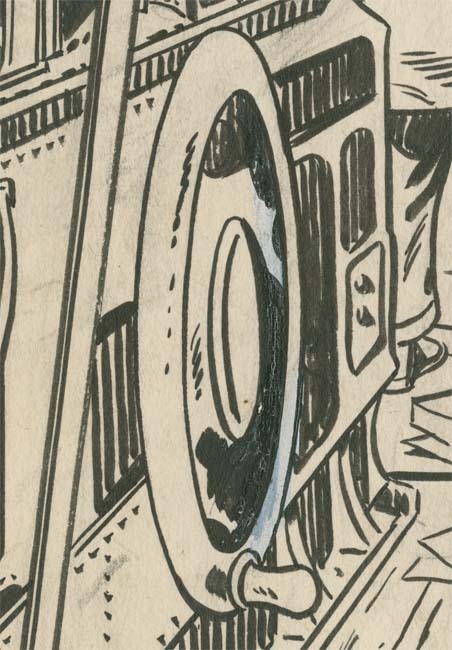 Even in this close-up it may be difficult to make out that much of the inking on the right side of the wheel has been done over white-out. 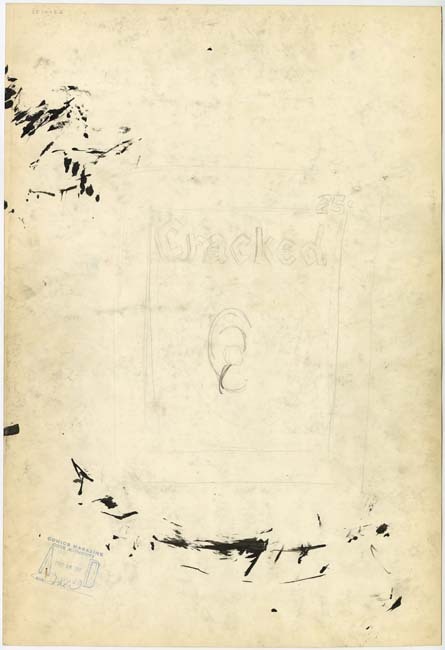 This is revealed by numerous small cracks in the inking. 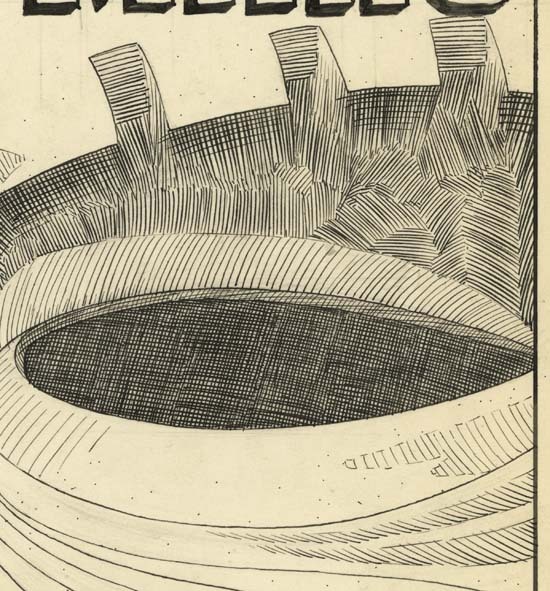 Such hair-line cracks often appear when ink is applied on white-out that has not completely dried. 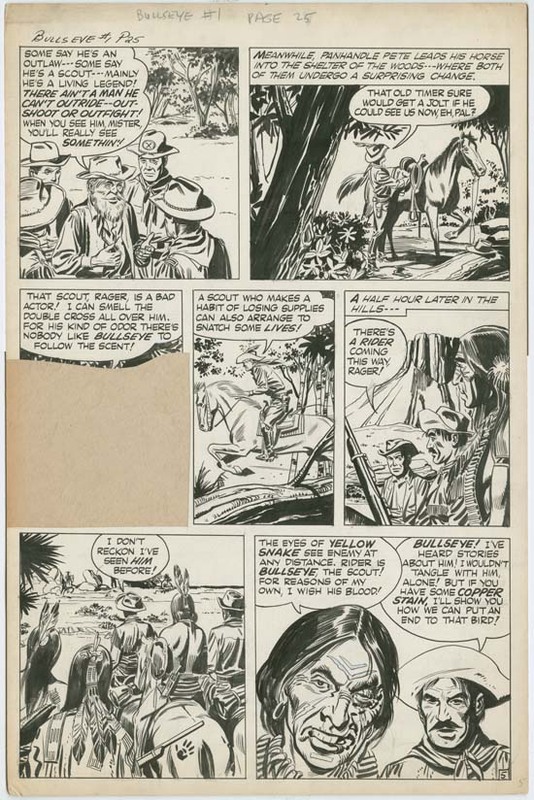 While this does appear to be a correction further examples suggest that it was not do to poor control of the actual ink brush. 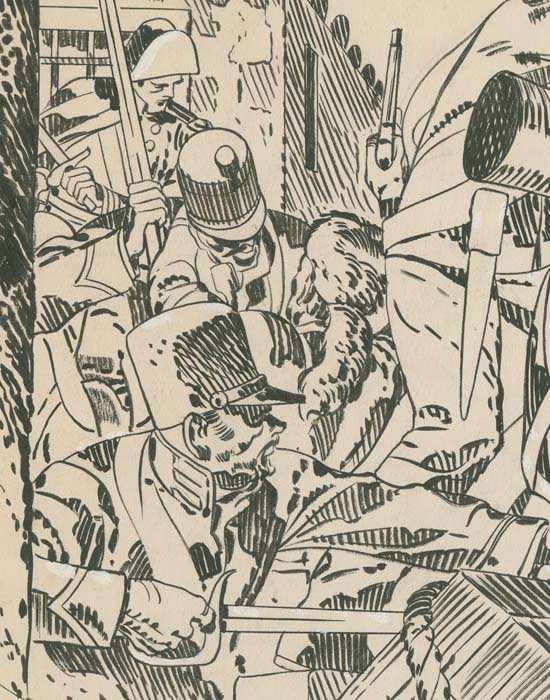 One of the corrections to the frame can be seen in this close-up. 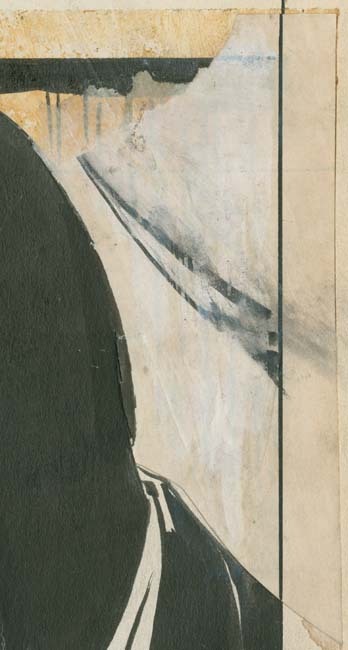 While the white-out is too opaque to clearly see what has been hidden there still remains some parts that have not been covered up to suggest that horizontal brushwork had extended beyond the frame and needed to be corrected. 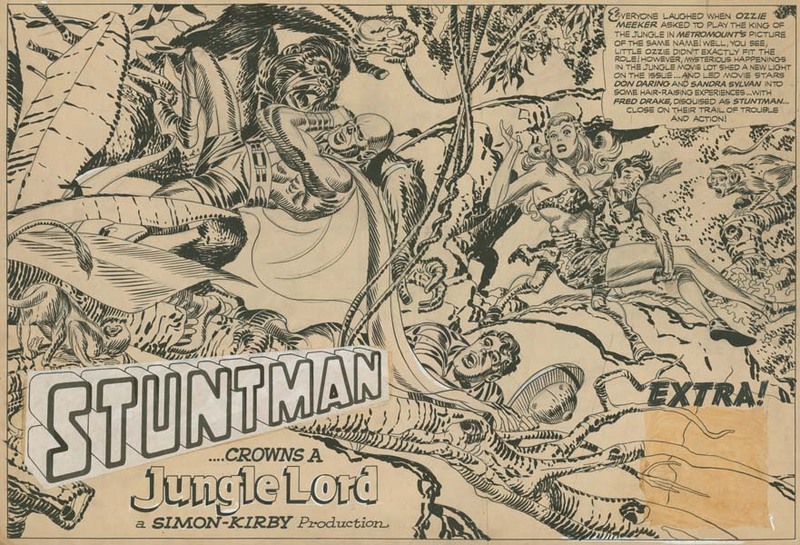 Well perhaps not needed because the frame lines were normally trimmed off in the published comic book. There is also white-out applied need the head. 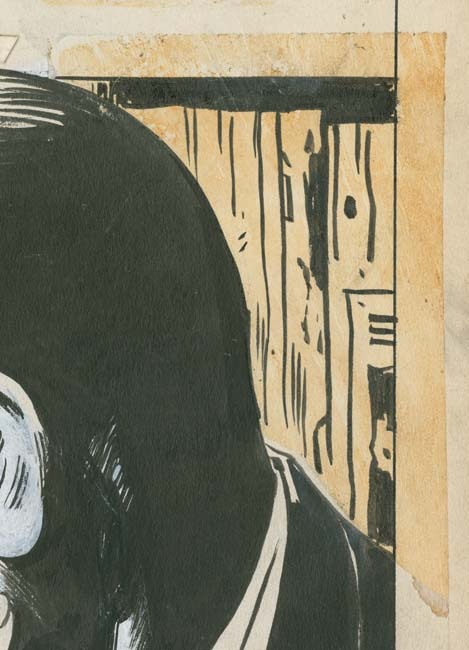 Here the ghost of the covered inking can still be observed, at least in part. While the outline has been narrowed slightly it is hard to understand why Stein thought this necessary. 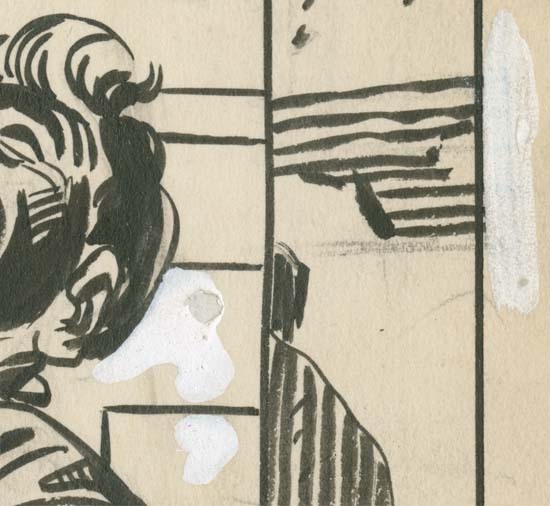 Perhaps the true reason for this particular white-out are in areas too opaque to be revealed. Here Marvin has used white-out to correct a leg. 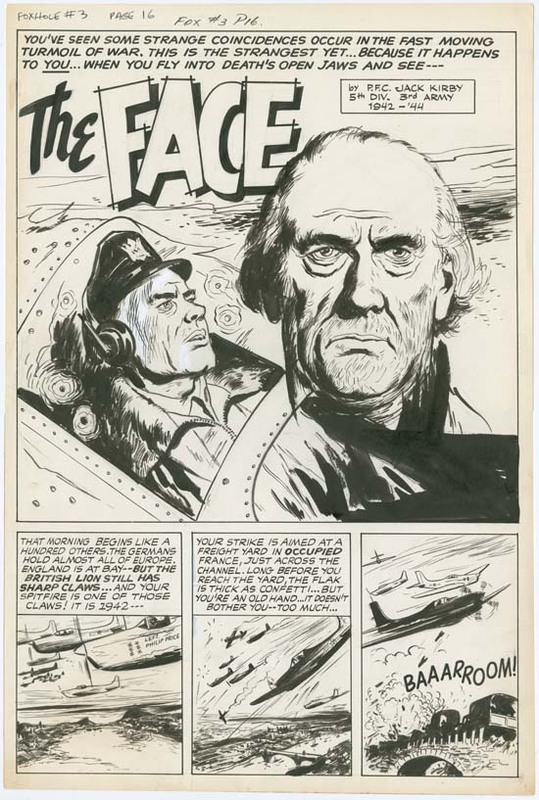 In this case the white-out was used very shortly after the original inking as some of the ink was still wet enough to mix with the white-out, turning it grey. 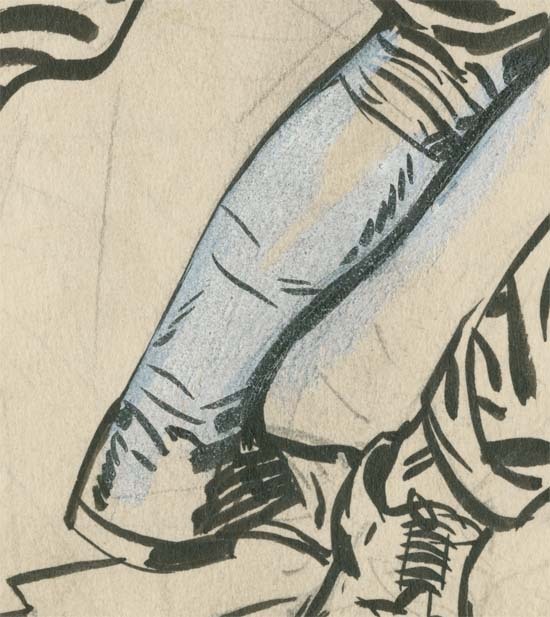 Enough of the original inking is still visible under the white-out to suggest the boot had much thicker outlines. 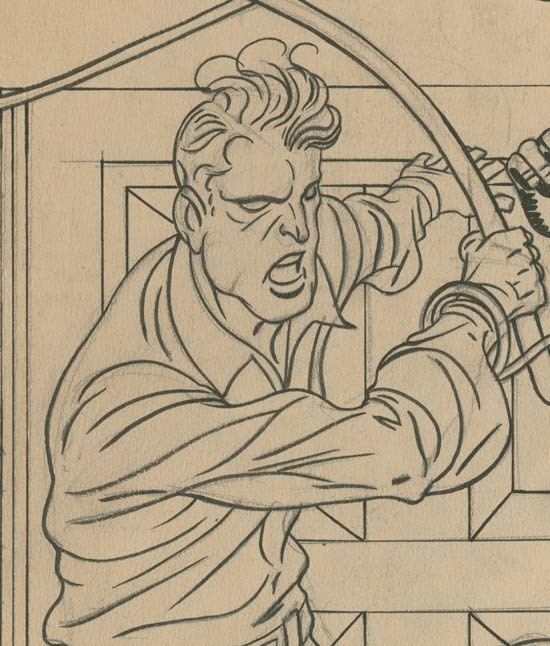 Note that the penciling can still be seen. Normally these would be erased after the inking was completed but in this case if any erasing was done it was done poorly. 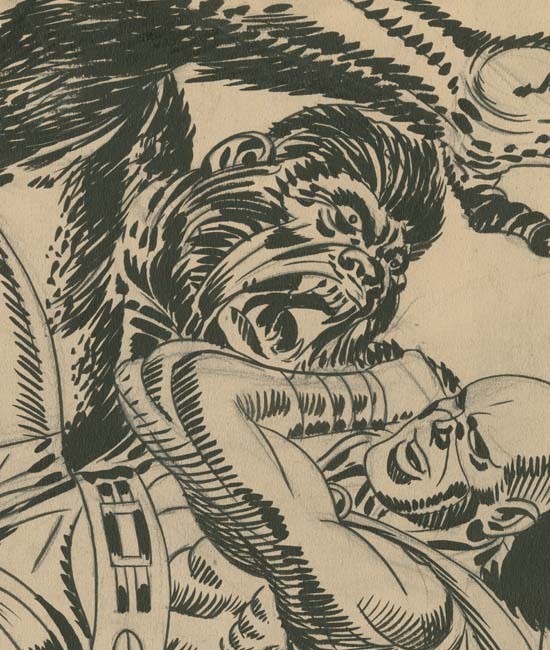 This is actually fortunate as it allows a glimpse into the original penciling. 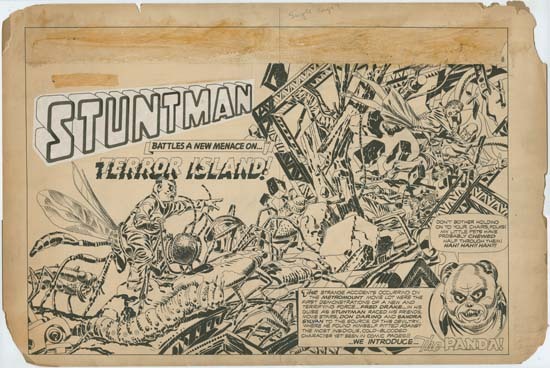 It appears that the original pencils were little more than a layout that Stein did not follow closely when inking. Once again Stein has applied white-out to inking that is still moist enough to cause it to turn grey. Either that or Marvin used the same ink brush to apply the white-out without getting it thoroughly clean first. This does not appear to be a case of Stein narrowing an outline. Instead the effect was to redraw the buttocks and lower back, flattening the buttock a bit and adding curve to the lower back. The correction shown in the above image is different from the rest. This was not a change in outline but of the spotting. Apparently Stein felt the original spotting was too dark and needed to be lightened up. 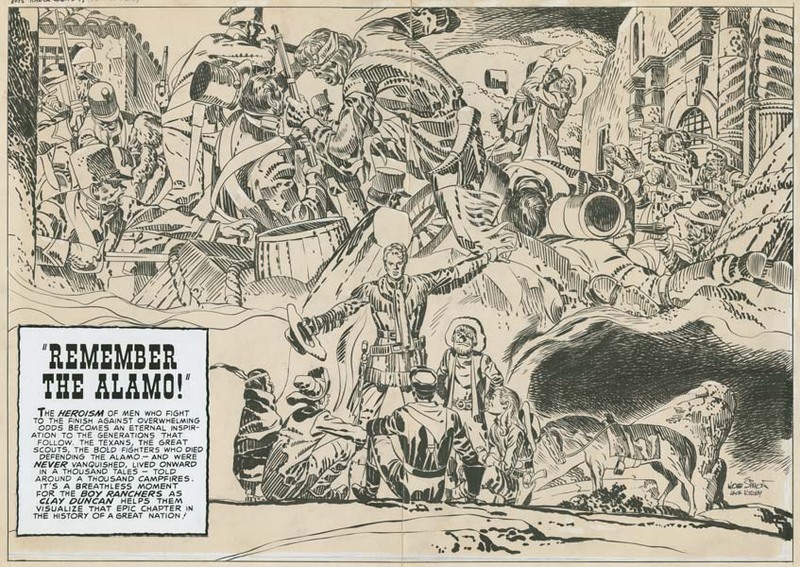 Today one might wonder if Stein was being a bit much of a perfectionist but he obviously had an idea of what the art should look like and was willing to spend extra time to achieve that end. 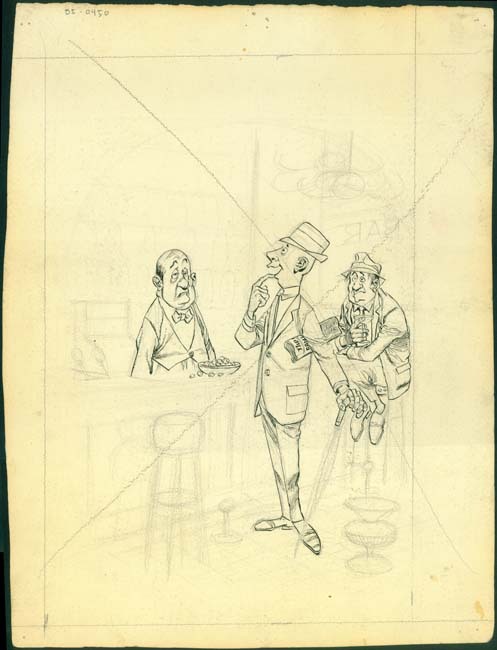 Marvin Stein’s pencils were rather loose, without details. Stein did the detail work in the actual inking. That being the case, any corrections would have to be done using white-out. 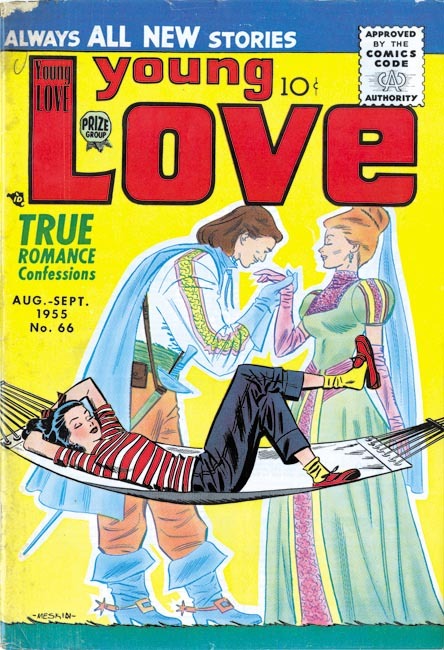 Marvin would become quite good at this approach and maybe someday I will post on one of his later covers. But for now that while the use of white-out does not disappear it seems to become less frequently required. 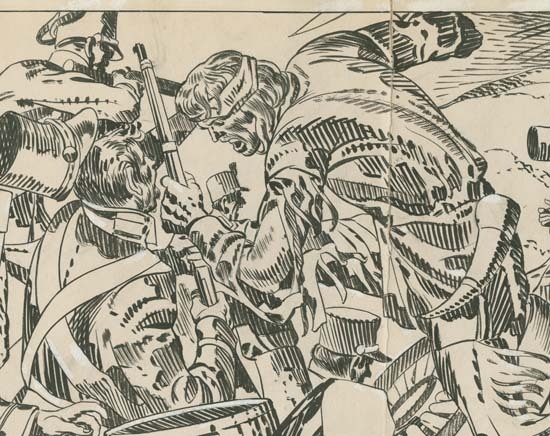 Also Stein would switch to a blue pencil for doing the initial penciling. 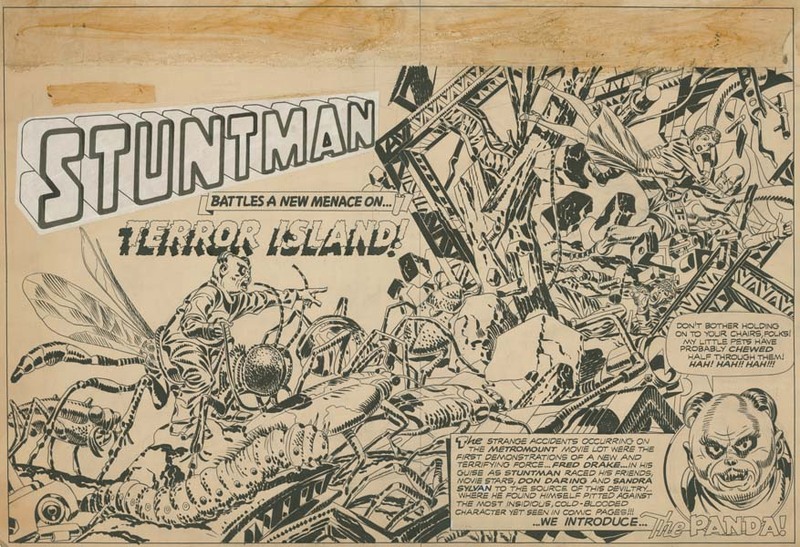 There were other comic book artists that also did most of their work in the inking stage. 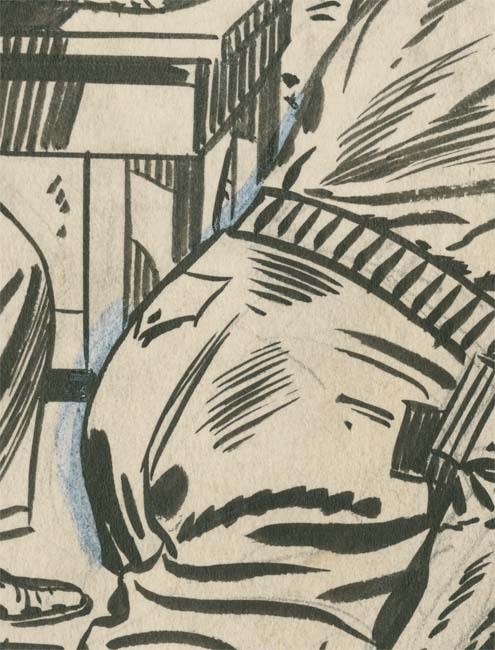 Usually such artists become overly concerned in providing detailed inking to the detriment of the art. Joe Maneely is an example who used this approached whose fine detailing resulted, in my opinion, in rather dry art. 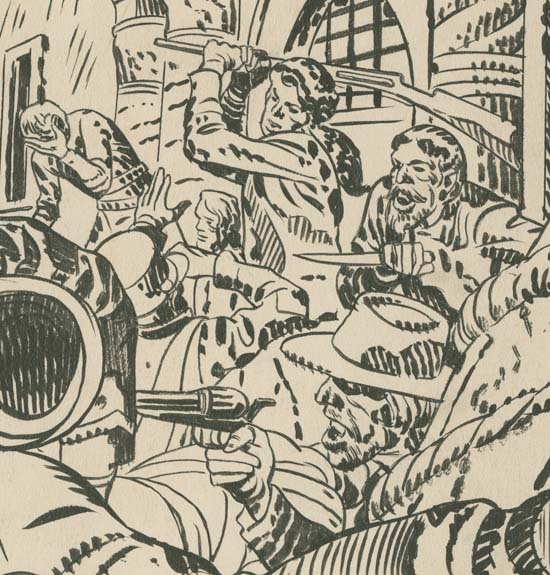 Marvin Stein never allowed himself get lost in details and his art, particularly for the crime genre, is fresh and full of impact. 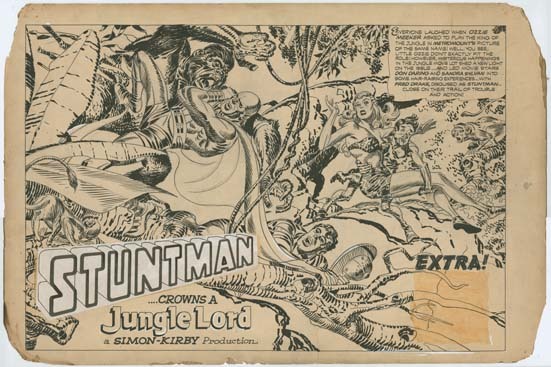 The real reason I picked this particular cover to write about is what appears on the back of the original art. 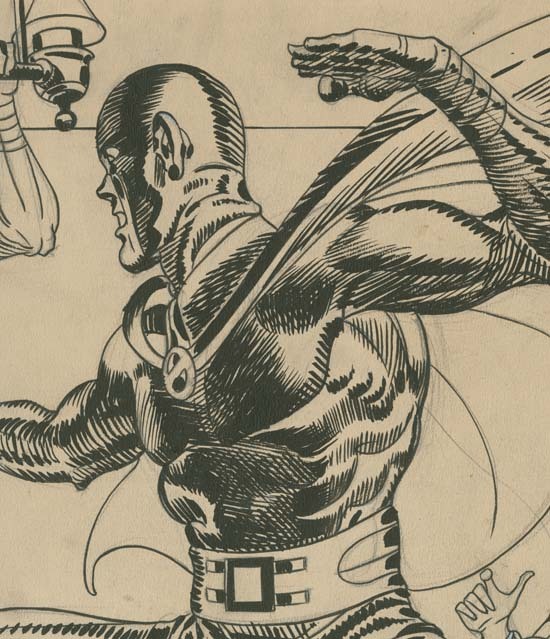 Normally what appears on the back of original art, if there is anything at all, is very limited in size and effort. But this piece is rather large and carefully worked out. It was done entirely in ink without any trace of pencils. The humor in this work is obvious. What is not so clear is why Stein did it at all. All this effort done for no more than some personal reason. But it is fortunate that he did because it provides a side of Stein’s character that was not revealed in the work he did in comic books. 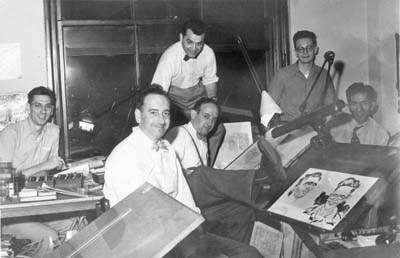 Simon and Kirby studio Left to right: Joe Genalo, Joe Simon, Jack Kirby, Mort Meskin, Jimmy Infantino and Ben Oda. 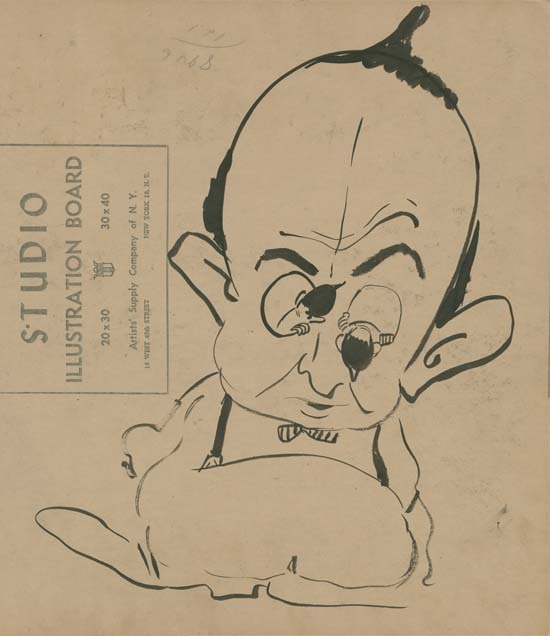 Caricatures (probably drawn by Joe Simon) of Marvin Stein and Jimmy Infantino. 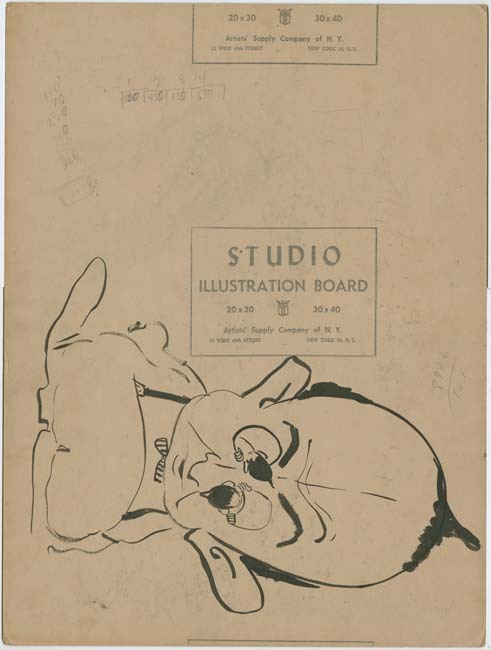 While it is hard to be sure, I believe this might be a caricatures of Mort Meskin, another artist who worked in the Simon and Kirby studio. 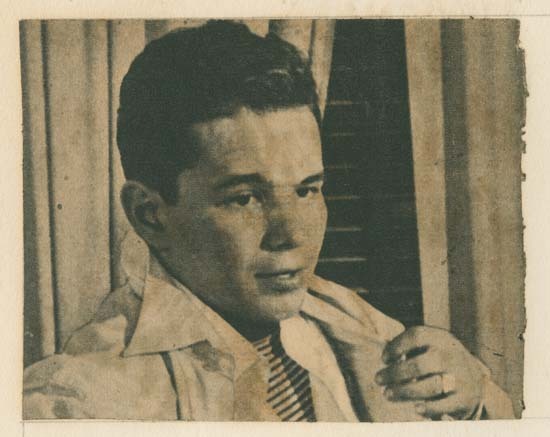 Note Meskin’s receding hair, suspenders and bow tie.